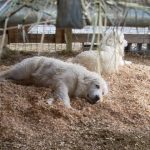 I just noticed that I hadn’t written about our Great Pyrenees dogs. Meet Pica & Skye (named by my daughter & her husband). I couldn’t tell you which is which as they are totally identical. One is a little larger than the other and one is bolder. Both are very sweet and loving and love raw eggs. They know exactly where to find them in the barn too! Speaking of eggs, they’re chicken chasers. Although harmful to the poor chicken being chased, they don’t do it out of hunger or aggression. They just love to chase and if a chicken does venture in the yard where they’re at, the poor chicken is in for the run of her life. Literally! They’re great with the goats although they enjoy chasing the kids, I’ve watched them & it’s just about being playful. I wouldn’t leave them in the same yard if I thought there was any danger for the kids. I’ve kept them with Boris for a while and they had no fear of him either. As a matter of fact, they loved to smell & lick Boris’ face. Boris on the other hand has no need for either of them! I’ve seen the big guy chasing the LGD’s or even try to bite them. On the whole, they got along well. I think that of all the animals that have shared their yard with the Pyrenees, only Boris didn’t try to eat their food! Pica & Skye will be a year old around March 2009. We bought them last May while we were at the local animal auction – a young lady was there offering a whole litter of them for about $25 each! They’re definitely pure bred (you can tell by the extra dew claw on the back leg), and their general appearance. Amazingly, no matter how dirty they get (there’s a lot of that nasty orangy clay stuff around here), they always return to their snow white color. I don’t know how they do it – I’ve never bathed them! In the end, the important thing is that they do their job and they do it well. I think these dogs never sleep. From my location I can see my entire farm and it seems like Pica & Skye are always on duty – watching and protecting their flock. They’re a wonderful addition to any farm… maybe we’ll breed one or the other later in 2009 & have puppies to offer. Stay tuned!